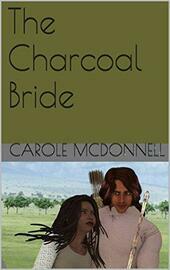 The Charcoal Bride is the first of a trilogy of short novels called The Hanrisor Chronicles. The trilogy chronicles the rise to power of Hanrisor’s King Skall and the family curse –called “The Hanrisor Legacy--that troubled him and his descendants. An oath is not easily broken, and an oath made to the god of vengeance is even more difficult to break. Thus Hanrisor – and Soghan, Skall’s place of birth—are two of many nations in the Malku universe who endured war. Although the fae and human rarely war, there have been times when war rose up between them, and the vow made by Prince Arvid was the cause of a family curse that affected his family for generations. King Skall rose to power because of such a war and his story echoes throughout the legends and myths of Hanrisor and other nations of Malku. This novella tells of Prince Arvid, Skall’s father, and his ill-fated marriage to Sellah, his Charcoal Bride. The second part of the trilogy, Sea-Walker, will relate how Skall traveled his new kingdom after he had inherited. The third part of the trilogy, How Skall Dragon-rider Won His Three Wives, depicts the heritage – good and bad—which Skall and his descendants inherited through the curse that Prince Arvid placed upon himself.